Place of Birth: Tarzana, Los Angeles, California, U.S.
Hailee Steinfeld is an American actress, singer, and model. Hailee’s father, Peter Steinfeld, originally from a family from New York, is Jewish. Hailee’s uncle is fitness specialist and entrepreneur Jake Steinfeld. Hailee’s mother, Cheryl (Domasin), was born in California. Hailee’s maternal grandfather was of half Filipino (Boholano) and half African-American descent. Hailee’s maternal grandmother had English, German, Scots-Irish (Northern Irish), and Scottish ancestry. Hailee is a first cousin of actress and model True O’Brien. I’ve become more aware of my roots over the years. My grandfather, my mom’s dad, was half African-American, half Filipino. And Filipinos, I’ve learned, have many wonderful traits – the main ones being passion and pride. I went to the Philippines for the first time this spring, and it was amazing. People were like, “We’re related! We’re family.” I actually played three of my own shows there. Hailee’s paternal grandfather was Herbert Melvin Steinfeld (the son of Samuel “Sam” Steinfeld and Bessie Zelensky). Herbert was born in New York. Samuel was a Romanian Jewish immigrant. Bessie was a Russian Jewish immigrant, and was the daughter of Hyman Mendel Zelensky and Sarah Cohen, who was born in Romania. Hailee’s paternal grandmother is Joy M. Duberstein (the daughter of Myra). Hailee’s maternal grandfather, Ricardo/Simonas Guillermo Domasin, was born in 1938 in Los Angeles, California. Ricardo’s father, Pastor “Peter” Loresca Domasin, was born, in 1902, in Panglao, Bohol, Central Visayas, Philippines. Pastor was the son of Gerónimo Domasin y Lorejo, or Gerónimo Lorejo Domasin in Filipino, and of Cirila Loresca y Domaluan, or Cirila Domaluan Loresca in Filipino. A picture of Pastor can be seen here. Ricardo’s mother, Evelyn Olivia Bain, was born in 1910 in Los Angeles; Evelyn was Hailee’s great-grandmother. Evelyn was African-American, and she and her parents, Thomas Edward Bain (born in Kansas, to Gabrel Bain and Isabella/Belle Johnson) and Wilma Frances “Willie” Peterson (born in Arkansas, to William F. Peterson and Nannie Hall), are listed as either African-American or, sometimes, as “Mulatto,” in census records. A picture of Evelyn can be seen here. Hailee’s maternal grandmother is Laurita Lee Hinkle (the daughter of William Hicks Hinkle and Edith Laurita Jones). Laurita was born in Texas, and had English, German, Scots-Irish (Northern Irish), and Scottish, ancestry. William was the son of Joshua Madison Hinkle and Ella Malona Payne. Edith was the daughter of Charles Kirby Jones and Ethel Effie Smith. Hailee’s matrilineal ancestry can be traced back to her fourth great-grandmother, Penelope “Phenina” Watson. 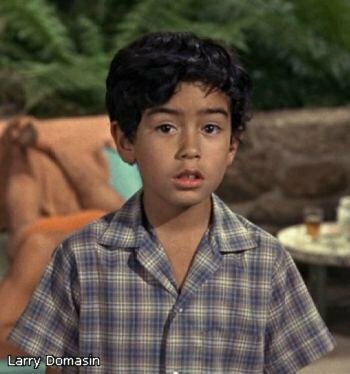 Hailee’s great-uncle, the brother of her maternal grandfather, is child actor Larry Domasin. Larry is pictured here and here. Same applies to her uncle Jake. I knew there was something more there than the Jewishness. I suspected it could be East Asian but it was hard to tell. Weirdly not too surprised by the African-American ancestry, the modelling is there. She looks a mixed race girl to me. Her representative denied it in 2011, but Hailee has now mentioned her African-American ancestry. Error-ridden ethnicelebs gets it right again.